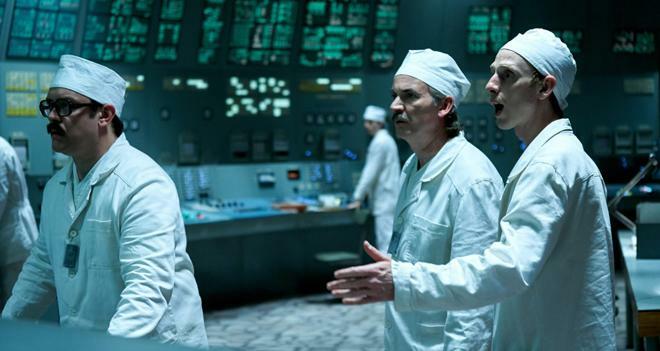 HBO has released the first trailer for Chernobyl. The upcoming five-part miniseries is set to premiere on May 6. Chernobyl stars Jared Harris (The Crown, Mad Men), Stellan Skarsgård (Melancholia, Good Will Hunting), Emily Watson (Hilary and Jackie, Breaking the Waves), Paul Ritter (Lovesick), Jessie Buckley (Beast), Adrian Rawlins (Harry Potter and the Deathly Hallows), Con O’Neill (Harlots), Sam Troughton (The Ritual), Adam Nagaitis (The Terror), Barry Keoghan (Dunkirk), Ralph Ineson (Harry Potter and the Half-Blood Prince), Mark Lewis Jones (Star Wars: Episode VIII – The Last Jedi), Fares Fares (Westworld), and David Densik (McMafia). The series is written and executive produced by Craig Mazin (The Huntsman: Winter’s War) and is directed by Johan Renck (Breaking Bad). Executive producers include Carolyn Strauss (Game of Thrones) and Jane Featherstone (Broadchurch), along with co-executive producers Johan Renck and Chris Fry (Humans). Finally, Sanne Wohlenberg (Black Mirror) is on board as a producer as well. Beyond Chernobyl, HBO also recently released the first trailer for Game of Thrones: Season Eight. The show's final season is set to premiere on April 14 and will consist of six episodes.